A large round barn, built as a show barn and arena, standing on the grounds of the Central Wisconsin State Fair. The barn has a band of clerestory windows and a cupola. A windmill is behind the barn on the left. Painted on the barn are signs: "F.A. Felhofer Designed Erected," "World's Largest Round Barn," and "Farm Products Exhibit Up-Stairs." 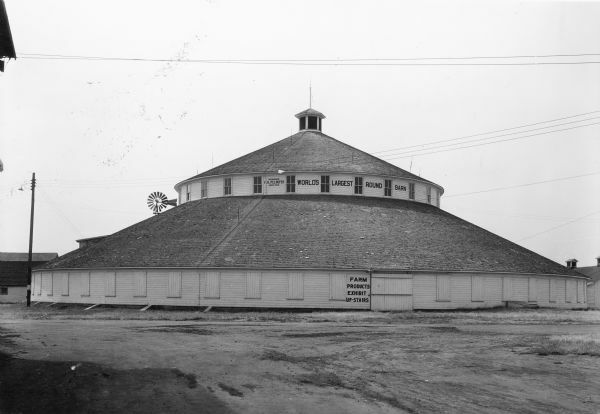 According to the website of the Central Wisconsin State Fair, the barn was built 1915-1916, is 150 feet in diameter and 70 feet tall to the top of the cupola.